In this tutorial we will cover all the steps of deploying WordPress site on domain. At the end of tutorial you will have secure working WordPress site. The whole tutorial is step by step and assumes little or no technical knowledge or background in creating website . 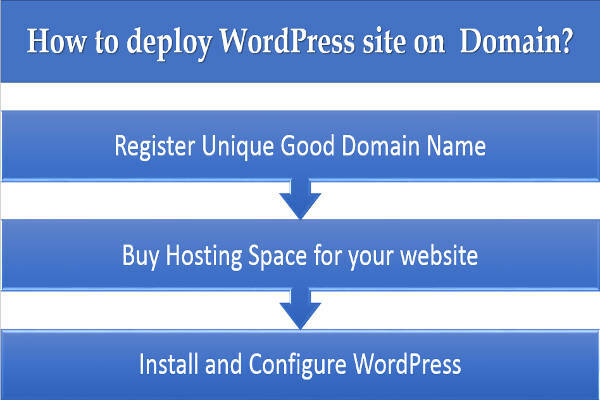 There are three steps involved in deploying WordPress site on your domain as shown in below image. In this lesson we will focus on first two points. They are less time consuming and will take only couple of hours at max. From next lesson onward we will dive into third step in details. How to select Good Domain Name for your Site? This is first lesson of tutorial Deploy WordPress site on domain. In this lesson we will cover Domain names in details. In case you already own a domain name and installed WordPress on it then you can skip this lesson. Every website on Internet has an address. That address is domain name. For example Facebook has an address (facebook.com). Facebook.com is domain name of Facebook. You have to enter this domain name in web browser like Chrome and Firefox to reach Facebook. Location of any Shop is key to success. A decent shop located in highly active area has higher chances of doing business than a good shop located in remote areas with less buyer activities. Due to this very reason you may have witnessed good companies buying space near prime location. Take example of KFC, Dominos and other similar companies. They always are located in prime locations. That helps them generate good business. One major factor is ease of reach. Prime locations are easily reachable. This ease of reach helps in generating better business. But in online world you do not have that much location advantage. Every website is one click away. Having said that it is good to take care of few things before selecting a domain. Domain is address of your website. A good domain name helps your customer remember you. People can easily search your address on Google to reach you.They can easily type your address on Chrome to reach you. This ease of reach is prime reason of having good domain name. Lets first look at worst mistakes made by people while selecting a domain name. This will help you eliminate some domain ideas you might have. Also it will shorten list of domain names you might hae shortlisted. This is the mistake made by experienced website owners as well as New ones. Experienced people make this mistake to impress Google. They see what people are searching for on Internet. Then they come up with domain names matching those searches. For example if you are searching for top jobs in painting then they will create a domain name like top jobs painting. Hoping Google will rank their site higher in search results. This was the case few years back. But now Google become smart enough to ignore practices like this. New people also knowingly or unknowingly take long domain names. The problem with long domain names is ease of remembering. People often search Google to reach your website. The long domain names does not help. Lets understand the example we gave above. You named your domain top jobs painting. If your website is new and some one searches Google with top jobs painting they will see other websites in result. So visitors will be unable to reach your website through Google Search. Also it will be painful for them to remember long domain name of yours and type the while address correctly in web browser to reach your site. So your website is typically losing visitors. Note the visitors who come back to your website are very important. This mistake is made by new users. They tend to use domain name similar to top website already present there. For example there is a successful website example.com. You tend to create a website example.in. Hoping that your new website will be as successful as other one. People thing if someone makes a mistake then they will reach your website. This will be good for traffic. Your website will become popular. But this also creates competition. The other website is already popular one. So you will always face stiff competition with that website. People of search for example in Google will always get example.com in search results. Your new website will not feature. You can only feature in search results if you can beat the old website. This takes time and effort. The new website in initial stages will be unable to beat the old established website. So you should always avoid any domain names which are already popular. Do you think if you create Facebook.in you can beat Facebook.com? You can beat Facebook.com creating another site newbook.com but not Facebook.in. So never ever create a domain name similar to already popular website. It increases competition and rewards are very less. Domain name should not contradict content of your website. This mismatch between name of site and content confuses visitors. They tend to think the site is spam. For example you created a site with name techmantra. With this name visitors will assume the site is about Technical tips. It should have content related to technical stuffs. What if visitors finds many contents related to travel destinations or pet foods. They will get confused. It ma look like spam site or site without any theme. Nowadays people are more interested into topic-centric websites or blogs. So you should always think will the content you are planning to post on the site is relevant to domain name. Which one is easier to remember and speak out? The answer is obvious. We all like simple things when it comes to memory. It is easier to remember a easy name then a difficult one. People will not be able to remember complex names. Word by mouth is great way to recommend sites. It is offline promotion of your site. A person who liked your site will recommend to other by name. But what is the name is too complex. Will they be able to remember or tell the spelling of it correctly. The chances becomes less. So if it always better to have simple easy to remember and spell names. There is no point having a fancy difficult domain name. This is the case if you have multiple words in a domain name. For example if you are creating a site on technical tips then you may want to name your website tech-tips. This is allowed. You can use hyphen in your domain name. There is nothing wrong in it. But it is better to have domain name without any separators.Personally I would dislike having a separator in domain names. Major brands around the World does not have it in their name as well. Enough of negative things. Now lets discuss about positive things. Lets discuss things you should take care while creating your domain name. Note in first mistake we mentioned too length domain names are mistake. So should you create 2 or 3 letter names. The answer again is No. The optimal length is 5 to 9 characters. Anything outside this range is either too long or two short. Note there are exceptions too. There are people who have tasted success with domain names more than 9characters or less than 5 characters. Note you can stretch the upper limit to 15 characters if it is difficult to have a domain name inside 9 characters. But I will not recommend you to take exceptions. You should think of a name which is between these limit.Lets look around some famous websites online. This list can go on. Most of them fall into this range. There is no harm if you select something above 9 or less than 5. For example ebay is successful with 4 characters. It is the normal practice we are talking about not a rule. If a name of 12 characters better represents your site then select that name. But make sure it satisfies other criteria mentioned in the article. Now this is very important. Your name should be unique. At least you should be known by that name. It should not happen that thousands of site are popping up with that name or variants of it.The uniqueness factor is more important for stores or online business. People tend to remember and suggest brand names. They do not suggest names like best website creator. For example PayPal is brand itself. It was created to transfer money online. They could have named their site Money transfer online. That would have bought them search traffic. Money transfer online is functionality provided by the site. It should not be name of site. Most people make this mistake. Instead of focusing on unique Brand name they focus on task provided by site. They think having a name similar to task will help people find it. It will help people easily relate to it. But there are too many sites providing that functionality. The content of site should describe the functionality. Your website name should be good enough to turn into brand. All famous sites and blogs out there on Internet had this feature. All those successful sites had unique compelling name from start.Once they became popular then they turned into brand names. So it is always better to have a brand name like domain name. People associate or love to search brands not the functionality they provide. Your domain name should not be competitive. You should be able to rank first place in Google Search or Bing Search for your domain name. So before selecting a name do a Google Search with that name. Take note of search results. See if the search results have any website with your domain name. For example if you think udinra as your domain name then see if there is any site in Google search with udinra.net or udinra.org etc. It is better to select a different name then. But if you still have to go with same name then look at popularity of the site. You can use alexa.com to determine popularity of the site. The lower the rank the better. If the rank is within 50K then you should select different name for you site. Well established sites always outperform new sites. So selecting a competitive domain name will be disadvantage in initial days. People will always find old established site when they search for your site by domain name. How to choose domain extension? You might have noticed that every address on Internet is of form domain-name.domain-extention (like google.com). Here Google is the name and .com is the extension. We have discussed about the name part above. Now lets discuss about the extension part. There are many extensions available. The most popular one is .com. Below is some norms regarding extensions (popular ones only). Note this is just norm it is not a rule which needs to be followed. Most of us can select .com and it just works fine. But there are new extensions added in recent times. You can have extension as .me, .online, .net etc. Note extensions itself do not add any value to the site. The only thing is visitors most of the time assume .com as extension. There are country specific extensions as well. Indian websites can use .in extension. Similarly US sites can use .us extension. You can also apply for country specific extension as well. Mostly .com extension are costly as they are the most popular ones. .com should be your first preference. If you are not getting it or it is very costly then you can go for country specific domain extension. But do not think that domain extensions play huge role in your website success. The hosting companies which provide you with hosting spaces also provide you domain name. The technical terms used is register. This means you have to register domain name in your name. Generally you will have to pay annual fees. Some companies allow you to have multi year registration offering discounts for multi year. After expiration of the period you have to renew your domain name. If you do not renew it then it will become free. Other person can then register it. Normally you should buy domain name and hosting space from same company. I prefer it this way initially. But when you have some experience handling these then you can register doain name with other company and hosting space with other company. The support and infrastructure is good. After selecting domain name and hosting space it is now time to educate yourself about WordPress and then move over to deploying WordPress on your domain. You can select one click WordPress install for installation with ease. Now that you have a domain name with you and hosting space with WordPress installed. Note I recommend using WordPress to create you new blog or website. I have written detailed article on reason s you should select WordPress (links below). You can follow the step by step guide to learn WordPress and create your own site with it. It is easy and fun. Next Next post: How to remove rel=”noopener noreferrer” from WordPress?